Western Saddle Bags by Outfitters Supply … Got Gear? We’ve Got Saddlebags for That. 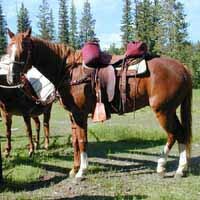 Saddle bags can be a great addition to your saddle, whether you are just out for an afternoon or heading out on the trail for several days. There are always items that a person should have easily accessible: water bottle, camera, binoculars, rain coat, cell phonesand GPS. We have several styles of western and endurance saddlebags in a variety of materials and colors to suit every taste and need. 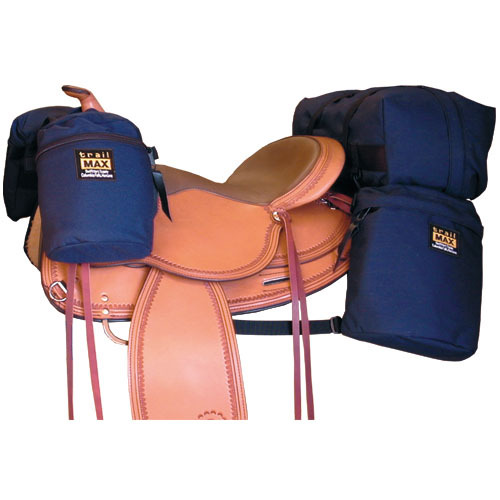 Our most popular style of western saddle bags is the TrailMax™ Saddle Bag System. Along with the large rear saddlebags, this system offers you a detachable cantlebag that is easy to pack and load. TrailMax Saddlebags are lined with removable foam insuliners to help protect fragile cargo. Lace your saddle strings through grommets on the saddle bags and use the nylon straps to attach them to the front rigging on your saddle. 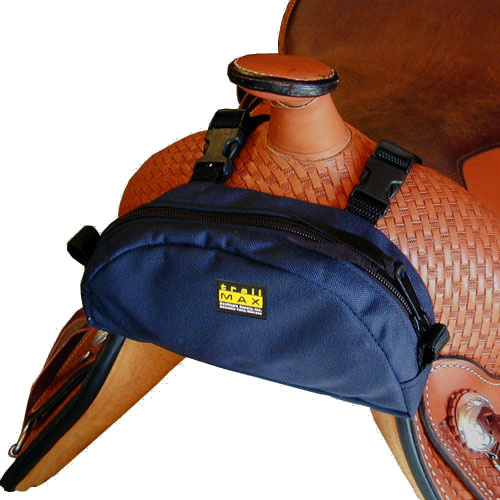 When properly and securely attached, these saddle bags will not shift or slap against the horse’s flanks. Made from 1,000 denier cordura nylon in two sizes and six colors, the TrailMax™ western saddlebags are durable and machine washable. They are reinforced at all wear and stress points and come with a limited lifetime guarantee. 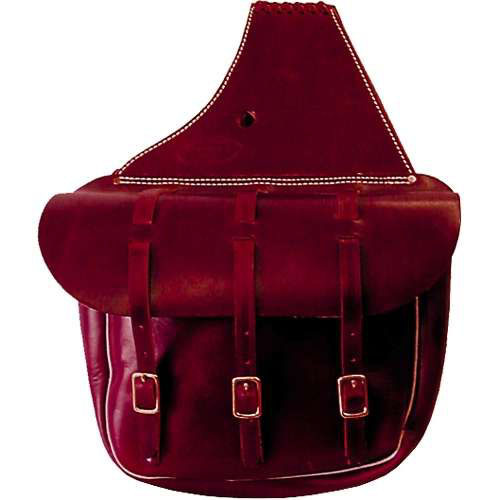 Our Cavalry style saddlebags are handcrafted in the Outfitters Supply™ shop from the finest burgundy latigo leather. Beyond the classic look, these saddle bags will most likely outlast any others available. Their unmatched quality jumps out at you. Cavalry style western saddle bags are available in two styles; three-buckle full size or two-buckle ¾ size. If you don’t need all the space offered by a traditional saddle bag, we suggest the TrailMax™ Daytripper Cantlebag. Made of 1,000 denier nylon in six colors with a sewn-in tricot foam liner, the Daytripper provides convenience and protection in a low-profile package. 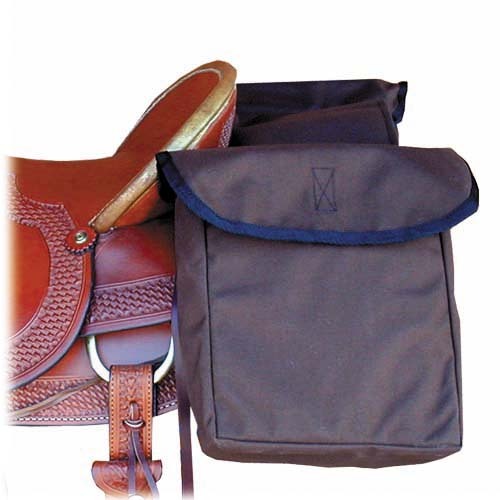 A terrific addition to your western saddlebags is the TrailMax™ Pommel Pocket. This little gear bag is perfect for those few little things that you need close by that always fall to the bottom of a larger pommel bag like keys, camera or a cell phone. The Pommel Pocket will fit over your horn bags or can be used alone when you are just out for a quick afternoon. Economy and value. Finally! Basic saddle bags that don’t skimp on quality. Made of the same 1,000 denier nylon as our TrailMax western saddle bags with a velcro flap closure, these saddle bags are simple yet durable and machine washable. Lined with tricot™ foam, your gear will be protected. The TrailMax™ Economy western saddlebags attach to the saddle’s front rigging with leather tie straps and have grommets for saddle string attachment. Whatever your needs, if you have gear, we have a saddlebag for that. Would you like more information about packing with saddlebags? Russ On… How Much Weight can my Horse Carry?